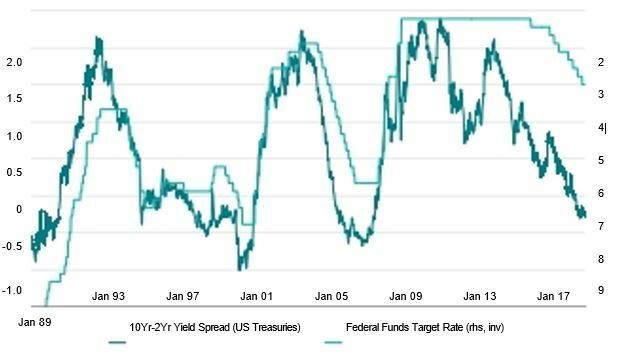 US yield curve inversion: Do we need to worry? The US yield curve has flattened significantly in the course of 2018 with shorter-term interest rates rising much more than longer-term yields. In the past, flat or inverted yield curves have coincided with recessions (see chart), which is why this development may raise doubts about the current, rather optimistic outlook for US growth. Here is why a flatter yield curve tends to foreshadow an economic slowdown: central banks typically raise short-term interest rates to reduce inflation pressures that emerge during a strong economic expansion. This lowers the inflation expectations component in bond yields. However, the central bank’s action also raises real yields. Higher borrowing costs subsequently slow the economy. A yield curve inversion means that the bond market has begun to discount a future easing of monetary policy, which in turn implies that the central bank has tightened policy too much, increasing recession risk. Some argue that there are structural reasons for the yield curve in the past instance, they suggest that the term premium, which is the added interest that investors receive for holding longer-maturity bonds, should be smaller than in the past as inflation risks are fundamentally lower because of central banks’ apparent success in containing inflation, which has helped to permanently lower inflation expectations. We have some doubts regarding this argument, not least because the curve has been just as steep in this cycle as in past cycles and because US inflation expectations are in fact back to average levels. Moreover, some factors, including much higher government debt, suggest that the term premium should actually be higher than in the past. Hence, we believe it is premature to discard yield curve inversion as a warning sign of recession. That said, we do not actually expect the curve to invert in 2019, not least because the Federal Reserve (Fed) itself is likely to regard a flatter curve as a warning sign. If the curve becomes too flat, the Fed will likely pause its tightening path and thus allow the curve to steepen again in response to less restrictive policy. USD yield curve steepness vs. the Fed funds rate.